Hello, world! As per usual, I have been sadly neglecting this poor little blog for the past few months. But, I can't let it go. Something in me just wants so badly to make it work. I guess we'll see! So, if I'm not committed to the blog, why am I even here? Well, okay. Here's the thing- I literally don't know what I'm doing. I suppose the best way to describe how I'm feeling is to put it like this: I feel like there are four different personalities in this short body of mine. 1. Becca: The happy, cheerful, fun-loving girl that everyone knows. She constantly talks about her cats and how much she would rather be in Disney World (or Disneyland!). She is also a Gleek and could talk about Chris Colfer for hours and hours. She's a huge Broadway junkie. She loves to be around friends and family, but also needs lots of time alone (#introvertproblems). Becca really enjoys reading, but gets distracted easily. She loves sleep. 2. Mrs. Fletcher: the teacher whom very few ever see in her natural element. She loves her students with a passion and will do anything and everything she can do to get them to succeed. She is always on the lookout for new theories, ideas, and (of course) cute school supplies. Mrs. Fletcher absolutely loves connecting with other teachers online through Facebook groups and Twitter. She loves sharing funny kindergarten stories with teacher friends, and she is pretty active in building her Professional Learning Community with Twitter chats. Mrs. Fletcher loves to stay up and cut out laminated centers for her students, but she hates not getting enough sleep so she doesn't do it often. 3. Becca the artist: this girl loooves to spend hours upon hours creating hand-lettering projects to share and sell! She likes experimenting with different brushes, colors, and techniques. She lacks confidence in her abilities, but takes time to practice different styles and fonts. She loves creating things for friends and family (and honestly hates being put into the awkward position where people expect her to do things for free because they are friends and/or family). 4. Rebecca Fletcher of Coffee, Cats, and Kinder/the business owner: the creative entrepreneur who is always on the lookout for new marketing strategies. She spends a lot of time trying to grow her online following to, in turn, grow her shop traffic and overall business. Rebecca Fletcher of Coffee, Cats, and Kinder is very strategic about marketing herself and her business online. She actively tracks how many Instagram followers she has, and loves collaborating with other small business owners. She doesn't like to sleep. These three ladies have very little in common, and they all think completely differently. It's very rare to see two of them simultaneously: when I'm in a zone (whether it be teaching, creating, marketing, or Disney-ing), I'm in a zone! And, when I'm not, I'm just Becca. I hope you all can see the battle I'm fighting here. So, here's the other thing- how the heck am I supposed to make these four ladies get along? How can they coexist without driving me absolutely bonkers? Here are some other things I think about constantly: what kind of audience should I be speaking to in my blog/Instagram/Twitter/shop/whatever? Like, if I spend time talking about teaching, are my artist/creative followers going to leave? Will I scare off potential customers by talking about something non-shop-related? Do my teacher followers even care about my cats or Chris Colfer spiels? I know that some people are reading this and saying, "Why does she even care? Honestly, though, who cares if she loses followers because of something she's talking about? Why does she care about social media so much? There's so much more to life than that!" Life is too short to only have one passion. And I was like, WOAH! THAT'S ME! So, blog readers, I'm asking you to show me a bit of grace. If I seem frazzled, I'm probably trying to field a disagreement between one of my four personalities. If I'm elated, it's probably because I've just had a breakthrough (and you should ask me about it)! And, if I look like I'm going to fall apart, just shove come coffee in my hand and show me a picture of my cats. Eureka! I've figured it out! I know why it's so hard for me to blog consistently. I know why I go off on tangents when I talk (and even when I think). I know why I'm always so tired! Hey, all! Just wanted to pop in for a quick update. I had planned to do a post today with updates from my summer reading list (I'm cranking right through it! ), but my plans fell through. It was the silliest thing (and also quite traumatic for me [and probably the kids])! During summer school, I was sitting criss-cross applesauce on the floor (as every good kindergartener should) and playing a dominos game with my kiddos. I guess was probably sitting like that for about 20 minutes. When it was time to clean up, I stood up, took a step with my right foot, and down I went! I had no idea what had happened, but I knew that I was hurt. I distinctly felt and heard a POP as I was on my way down! I sent the kids to go get the teacher next door. Meanwhile, I figured out that my right foot had fallen asleep while I was sitting on the floor and I just hadn't realized it. I was iced, rolled out in a wheelchair (because I couldn't really put any weight on my ankle), and driven home by some fabulous coworkers, and I have been laying around with my ankle elevated and iced all day. The outside is still pretty swollen and very tender, so I'll probably end up going in for an X-ray tomorrow. It's been pretty boring, but at least my ankle definitely feels better than it did this morning! I took advantage of everything and have just been relaxing since I got home, which isn't something that I am usually interested in doing! Hey, everyone! I am SO glad that you're here, because I am going to be telling you all about something that I am so passionate about and truly love doing - connecting with other professionals! Over the past few years, I have seen huge growth in my PLN from connecting with teachers via social media. If you're interested in learning how you can get connected, too, skip the next paragraph and keep reading! If you're not interested in building connections with other professionals, I want you to take a minute and think about why. What doesn't sound great about learning from other peoples' experiences? Why not talk with someone who has had a similar problem as the one you're having (and has successfully solved it)? What's the harm in putting yourself out there, even if only for a few months? I promise you that it's worth the risk! Have I convinced you yet? Keep reading! While they both have their merits, I tend to think of a PLN as a Professional Learning Network. As a further explanation, a PLN is a network of people that you communicate with on a regular basis. Everyone's PLN is going to be different, or personalized to their own needs, because of the people they choose to communicate with. My PLN isn't going to be the same as someone in another country, state, or even the classroom down the hall from mine! Why is it important to have a PLN? This is a really important question to consider; after all, if you don't buy in to the idea of building a PLN, it's not going to be important to you! I think PLNs are vital to all teachers (and all professionals, for that matter) because they break down barriers and allow you to communicate with others regardless of location, time zones, and even varying levels of busy-ness. "We need more PD days!" "How can we be expected to learn new things when we only meet for PD a couple of times a year?!" Great news! Having a PLN that is fueled by social media means that PD sessions are no longer confined to long, boring days in your school building (when, let's face it, you'd probably rather be working in your classroom)! With a solid PLN, professional development can happen any time, anywhere, and everywhere. Think about it: when you graduated from college, who was in your network? College friends and classmates, your own teachers, the teachers from the school(s) where you student taught... and that's it, right? Don't get me wrong, that's a fabulous place to start! However, with so few connections, there are bound to be some gaps. By using social media to grow your PLN, you can be connected to as many people as you choose to connect with: people with more experience than you, people with less experience than you, people from other schools/states/countries, people who teach in different settings (urban, suburban, rural, international schools, Title 1 schools, etc. ), people who teach different grade levels, school and district administrators... the list goes on and on! These people all have valuable experiences and information to share, and they're willing to share it! On the flip side, you are also a valuable source of experience and information! Your connection with someone can absolutely be mutually beneficial, even if you don't think you have much to offer. Let me say it again for the people in the back: YOU ARE A VALUABLE SOURCE OF INFORMATION! Use your experiences to help other people! For example, I have taught kindergarten for three years at the same school. I don't have much teaching experience yet, which used to make me think that I didn't have anything to contribute, but then I was asked to present a PD session at my school about utilizing Donors Choose and fundraising. BAM! There it was! Little ol' me, with my very limited experience, was suddenly the expert that people came to for classroom fundraising. I began to realize that I really could contribute to other peoples' learning. Through the use of Facebook groups and Twitter, I have been able to connect and share my own knowledge and experience on many different topics with educators from around the world. I can't even begin to note how many questions I have asked in my favorite Facebook groups and gotten hundreds of responses! I have participated in Twitter chats and made wonderful, helpful connections, and even gotten an invitation to a teaching conference! I have seen collaborations between teachers such as cross-country pen pals, Skype sessions to different parts of the world, book exchanges exchanges... all things that help broaden our students' minds! It's fantastic! Take a minute to answer this question: what do you think/know/have that could be of use to someone else? Maybe you have a certain way to set up centers in your classroom that makes them run smoothly in the first week of school (AKA you are a miracle worker- wow!). Maybe you have a tried-and-true method of classroom management. Maybe are great at keeping your classroom organized throughout the school year. Maybe you have a ton of connections that could help get guest speakers into your (or someone else's) school. You have things to say, and social media will help you speak into a much wider audience. If you're reading this, there's a very good chance that you're already on social media. In fact, I'd say that there's a 100% chance that you already are! If you're new to social media or don't use it often, it's best to choose one platform to begin building your PLN. Facebook: If you're on Facebook, consider joining a Facebook group tailored to meet your own needs. For example, three of my favorite groups are Simply Kinder, Kindergarten Teachers Unite!, and Lucky 2nd Grade Teachers. In those groups, I can talk with other teachers, ask and answer questions, share photos, see other teachers' classrooms and projects... there are so many ways that participating in these groups has helped me! Many of my own classroom projects came about because of something that I saw or read about in a Facebook group. Twitter: If you're on Twitter (which is my personal favorite platform for building my PLN), there are several different ways you can connect with other teachers. 1) Sign up for an account: (DUH, BECCA) for some reason that is completely foreign to me*, many people are not interested in using Twitter. If you want to participate, though, you have to dive in! If you're not sure how to sign up, follow this link to get started. 3) Engage: once you follow someone, you will begin seeing their Tweets. You can respond, "favorite" a tweet, or even Retweet (which means that their tweet will be seen by everyone who follows you). If you click/tap on a tweet and scroll down, you'll also be able to see other people who have engaged with that tweet. You can respond to those people, too, even if you aren't following them. 4) Tweet: you're all signed up, you've followed influencers and engaged with their stuff, so now it's your turn! What are your thoughts and opinions? What do you have to share? Punch them out and hit Send! As a note- tweets can only be 140 characters or less. That makes it tricky to type out your own thoughts, but also easier to read others' thoughts because everything is condensed and quick to read. 6) Participate in Twitter chats: this one is my favorite! Because I have just a little bit to say on this topic, I will be making a whole other post about it. But, in the meantime, I'll explain them! Twitter chats are held at specific times on specific days of the week, usually every week. In a chat, you answer questions posed by using a specific hashtag (such as #teacherfriends). Then, others can see your posts and you can see theirs. I love doing Twitter chats (although I don't get to them often during the school year because I'm just too tired)! I did 3 just this past week and came away following several new people, and with 20 new Twitter followers myself; not just random people, but other educators and administrators who I can now bounce ideas off of! When are you going to stop talking? No worries, guys, I'm almost done! 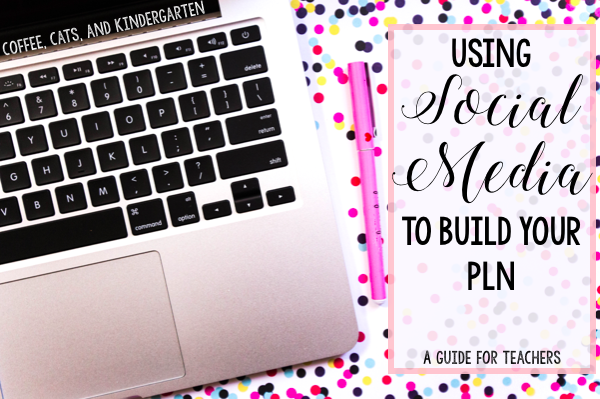 I really hope that this blog post has opened your eyes to the opportunities that are available to you when you use social media to grow your PLN! I know it can be scary; if you're not used to it, social media can be incredibly intimidating. But, when you think about it, we do tons if intimidating things every day: standing in front of large groups of children/teens, speaking to (sometimes irate) parents, being observed by peers and evaluated by administrators... in comparison, becoming active in a social media network is a piece of cake! Just give it a try. Summer is the perfect time to start! I promise that you won't be disappointed. Well, I (and my other RESA colleagues) worked so diligently on these tasks, staying after school many nights to commiserate work in the same place and feel less alone. Altogether, I estimate that I put in about 60 full hours, outside of school time, to get it all done. But, if you know me, you know that I love and need to stay busy! No Netflix bingeing for this girl! I am using this summer to catch up on lots of things that need done around my classroom! I have already given my students' seat sacks a thorough washing... guys, I'm pretty sure that there are illegal toxic wastelands that were less gross than some of those seat sacks. I wish I was kidding, eek! And I just washed them at Christmastime. But, I split them into 2 loads and washed each load twice with a considerable amount of detergent, and they're practically as good as new! I also need to spray paint my drawers, reupholster my library benches, make new student work clothespins... the list goes on and on! But, in addition to doing "maintenance" for items around my classroom, I also wanted to make sure that I am continuing with professional development over the summer. I don't want to be a victim of the "Summer Slide" myself! Since I'm usually running on fumes (and much, much coffee) during the school year, I kept making lists of things I wanted to accomplish and read over the summer. Well, the time is now! I am so happy to have had the chance to already participate in two different Twitter chats this week (hi, Twitter people! 👋), and I wrote down several more that I want to participate in. It may unofficially be "PD," but it's so fun for me to connect with other teachers and other educational professionals! I also sat down on Monday to make a summer reading list for myself. I always have great intentions, but I'm really bad at actually accomplishing things unless I make a plan of attack. My list is fairly ambitious, with 10 books so far, and I have already found two more that I want to add! So, in case you're looking for a summer reading list, I wanted to go ahead and share part of mine with you. 1. Crash Course by Kim Bearden - I am so excited about this book and dove right in as soon as I picked it up! I am about 6 chapters in, and I already have 2 full pages of notes jotted down. Kim Bearden is so inspiring to me! I love the anecdotal nature of this book, and I will admit that I love hearing her little stories of Ron Clark. 2. The Excellent 11 by Ron Clark - Like I just said, I absolutely love Ron Clark! I first picked up his book Move Your Bus last year when I was earning my M.S.Ed and, even though I barely had time to eat and sleep, I finished it in two days! I then read The End of Molasses Classes in less than a week. I also had the opportunity to see him at the Education Conference in Altoona, PA last summer, and it was amazing! I began this book during the last school year, but I lost track of time and had to return it to the library before I could finish it. (womp womp) I'm very excited to reread it and finish it this summer! 3. 32 Third-Graders and One Class Bunny by Phillip Done - While I don't know much about this book, the scoop is that it's another book full of anecdotes. Given my affinity toward Chicken Soup books when I was growing up, I'm really excited to dig in to this one! 4. The Daily 5 by by Gail Boushey & Joan Moser - I have been very interested in The Daily 5 since hearing about it in a teacher Facebook group last year. It seemed overwhelming to start a whole new program in the middle of the year, so I decided to investigate it this summer. I have heard wonderful things about the book and the implementation of it and am excited to see if I can utilize it in my own classroom! 5. The CAFE Book by Gail Boushey & Joan Moser - Though I don't know much about this book, it has come highly recommended by several teacher friends! It is the sister to the book above, which makes me just as excited to read it as The Daily 5! I'm going to make my way through these 6 books before attempting to finish the second half of my reading list, and I would love to share the other titles with you in a few weeks! What that an echo?! Ugh, it's been awhile. It's always so hard to come back to your blog after taking such a long time off. I mean, I'm less than a week away from having neglected this poor thing for a full 4 months! It's not something I'm proud of, but... it's something that I had to do. You guys, I don't want to sound like I'm whining, but this school year was so tough. I was constantly sick, I had a huge range of learning levels in my classroom, I had students who demanded a lot of my attention (in both good and not-so-good ways), there were other issues that needed dealt with, and I just didn't have the time or energy to do much else after getting home from school. Out of obligation, I made the choice to prioritize my classroom over most other things. Rebecca Fletcher is a participant in the Amazon Services LLC Associates Program, an affiliate advertising program designed to provide a means for sites to earn advertising fees by advertising and linking to www.amazon.com. Copyright Coffee, Cats, and Kindergarten . Blog Design by QDONOW Themes .